General Dynamics‘ (NYSE:GD) Electric Boat subsidiary has secured a $116.2 million contract modification from the U.S. Navy to manufacture a payload module for Virginia-class attack submarines. 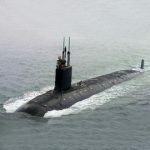 The Defense Department said Friday that Electric Boat will also develop insertion prototype materials for the service branch’s future USS South Dakota submarine under the modification. DoD noted the contract will run through November 2019 and work will take place in Indiana, New York, Virginia, Kentucky, Florida, Illinois, Washington and Maryland. The Naval Sea Systems Command will obligate $15.9 million from fiscal year 2016 research, development, test and evaluation funds of the service branch.